Bravo | Eat It, St. Louis! There are two things I can’t do without. Every year, my guilty pleasures’ debut set me all a tingle. I thoroughly bask the brief, yet golden glow they bring. The sun shines brighter. My coffee tastes richer. And the shoe sales are – um – shoe-ier. Every year I just can’t wait for McRib season and The Rachel Zoe Project. Yes, you heard me right. 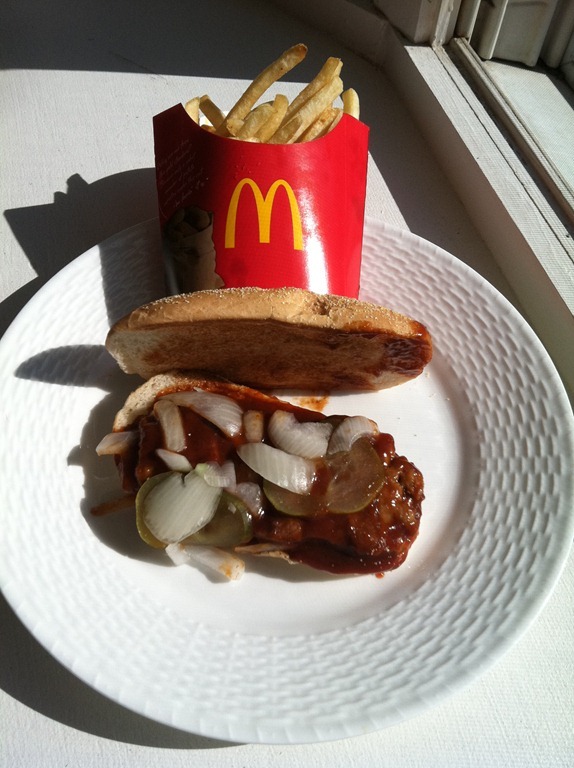 The McRib, all tangy and saucy and messy and mystery, makes me giddy. The first hint of McRib season, which started right on schedule last week, makes me clap and bounce like a little kid while I gleefully wait in the drive-thru lane. Truly, it’s my happy meal. Yup. I break out the Wedgewood for The McRib. If it makes me THAT happy, though, then why should I feel SSSSOOOO guilty? Because I’m (allegedly) a grown-up, and I know better than to eat fast food. Because the McRib is much maligned by the mainstream, and I simply love it for what it is … or isn’t … or might be. Because I secretly care about what people think about me, and I really just want to be one of the cool kids (but it’s troublesome with a big McRib sauce spot on my shirt). Which brings me to The Rachel Zoe Project, which I love with the same zeal as I love the McRib. And, much like the McRib, Rachel’s time with me is short. I feel her pain when she struggles to delegate. I get simultaneously anxious and teary-eyed with her when she watches her beautiful styling work walk the red carpet at the Oscars. I get angry along with her when those she’s mentored leave and try to siphon her business. Oh, this show allows me to be part of a glamorous, fabulous made-for-TV reality. But let’s face it: Rachel is one of the cool kids, and I have that pesky McRib sauce spot on my shirt. Damn. So these are my guilty pleasures. For eight weeks, The Rachel Zoe Project feeds my seemingly insatiable appetite for fashion and glamor and A-type success. And for approximately eight weeks, McDonalds will offer to feed my appetite while I struggle not to hit up every drive-thru for a McRib. Beware: The two (or three) times I can’t resist, kindly avert your eyes and move out of my way because I’m going to Eat It, St. Louis! *Of course, with a McRib in one hand and a Birkin in the other!